Despite Hyundai's occasional delusions of premium status. 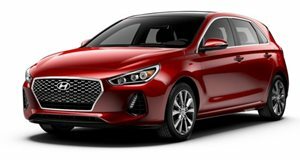 Hyundai might do some thing that'll sometimes make us scratch our heads, but the 2016 Elantra GT, just revealed in Chicago, is the kind of thing that we like Hyundai for. It is a good product, well equipped, for a few thousand dollars less than the big name competition. Compare this to a similarly equipped VW Golf 4-door in particular, and the price difference might surprise you. The new model isn't a complete redesign, but rather a facelift with a few tweaks. The first thing that you'll likely notice is the updated grille, which has had quite a bit more chrome added to it. Along with this, there is a new set of 17-inch alloys. The interior is pretty much unchanged in terms of aesthetics, but there is a new infotainment system with next-gen sat nav, HD Radio, Apple Siri and a Blue Link system offering remote start, climate control and destination search. Under the hood is a 2.0-liter GDI engine providing 173 horsepower. Prices start at $18,800 for one equipped with a six-speed manual transmission.